I have to thank a favorite blog Fashionista.com for the following story, just too cute not to pass along. After all, how many of us could know that a cozy wool sweater could save the lives of adorable little penguins caught in an oil spill? New Zealanders found out during a recent disastrous oil spill off their coast the value of little wool sweaters. They prevented the penguins from preening their feather and ingesting the oil that could kill them. Penguins coated in oil, when quickly tucked into warm sweaters, were able to survive until rescue workers could get them cleaned up. According to Fashionista.com an independent green news site GIST put out a call for knitters to quickly come to the penguin’s rescue and New Zealanders heeded the call. In fact they heeded so well ultimately the word had to go out no more sweaters needed. A yarn company Skeinz published a pattern for knitters. You need a pair of 3.25mm needles, 1 pair of 3.75mm needles and a set of 3.25mm. dpn’s or circular. You must use 100% wool yarn. Cast on 36 stitches using 3.25 needle. K1, P1 to end of row and repeat this row seven times. Change to 3.25mm needles… Well, why don’t you just email me if you really want to make this sweater for your penguin. And while I’m talking about cute things, look at a birthday present I received from brilliant costume jewelry designer in Paris Natalie Bernhard. Absolutely adorable. 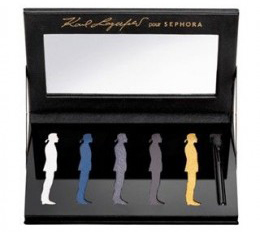 I had asked Natalie if she’d seen these brand new Karl Lagerfeld eyeshadows made in his shape in Paris. They have just come out but are only for sale in Europe and Singapore. America won’t have them for many months. Being so far away Natalie didn’t know my standard procedure for birthday presents for me. They are supposed to be new toys to be given as gifts at Christmas to children of families living at Transition House, children who have very little since their parents have lost their jobs and homes. So in her innocence Natalie sent me this delightful gift, the most wonderful surprise. She actually sent her mother off searching for them so it was a family project. There is one problem however, they are really too adorable to use. But I certainly am enjoying looking at them on my dressing table!